Page Street Publishing, 9781624145667, 224pp. 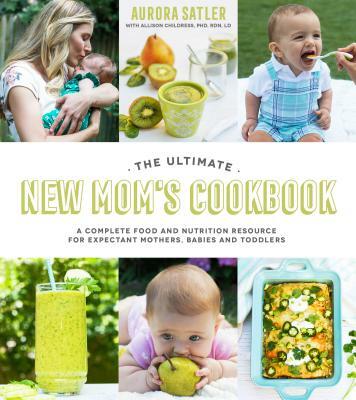 The Ultimate New Mom’s Cookbook is your guide to navigating this new world of prenatal nutrition, baby purees and picky eaters. Brimming with wholesome, satisfying recipes for every stage from the first day of your pregnancy to those tricky toddler years, this book eases your transition into parenthood and sets the foundation for your child to be a healthy and adventurous eater. Chef Aurora Satler and nutritionist Allison Childress anticipate your every new-parent need, with recipes for stocking your freezer for those first days home from the hospital, nutritious foods mom should eat while nursing and methods for introducing your child to new flavors and food textures. Delicious recipes like Tropical Tummy Mango Faux-’Jito soothe an upset stomach and satisfy intense pregnancy cravings, while Soba Noodle and Broccoli Rabe Buddha Bowls keep your energy up for sleepless nights filled with feedings. As your baby transitions to solids, nutrient-packed purees can be easily whipped up and repurposed into flavorful meals the whole family will enjoy, like Southwest Sweet Potato Cakes and Black Bean Salsa Fresca. This essential manual will nourish your baby from the first day of your pregnancy through the toddler years. Aurora Satler graduated from the Institute of Culinary Education and previously owned her own catering company in New York City. She spent five years as the creative director of Many Kitchens, and she styled their cookbook, Recipes from Many Kitchens. She lives in New York City with her husband and two young children. Allison Childress, PhD, RDN, LD, is an assistant professor at Texas Tech University and chief clinical dietitian at the Nutrition and Metabolic Health Institute. She is a licensed dietitian and specializes in pediatric nutrition and women’s health. She lives in Lubbock, Texas with her husband and three children. "Surviving child rearing and cooking for ourselves during the whole process is daunting at best. Brava, Aurora, for helping exhausted mothers get the nourishment they need." "I’m recommending this cookbook to every pregnant and nursing patient of mine. This cookbook is a great resource and guide for new mothers." "As a pediatrician and expecting mother, The Ultimate New Mom's Cookbook has been a godsend for healthy, flavorful and easy recipes. I would recommend this as a staple cookbook for all families."